Iran’s Leader Ayatollah Khamenei says the US presidential elections and the remarks made by the two candidates these days indicate that there is no spirituality among US authorities. Leader of the Islamic Revolution Ayatollah Seyyed Ali Khamenei referred to ongoing competitions in the US over the upcoming elections, and said the issues raised by the two candidates are clear examples of the consequences of ‘a lack of spirituality and faith’ among statesmen. “In upcoming weeks, one of these two presidential candidates, whose words and conditions you are seeing, will become the president of a country that has power and wealth, and the highest number of atomic weapons and world’s largest media,” Ayatollah Khamenei added. Elsewhere in his remarks, the Leader also called on Iranian authorities not to back down in the face of the United States’ ever-increasing demands. “We have, time and again, told [Iranian authorities] that if you surrender in the nuclear [case], they (Americans) will bring up the issue of the missiles. 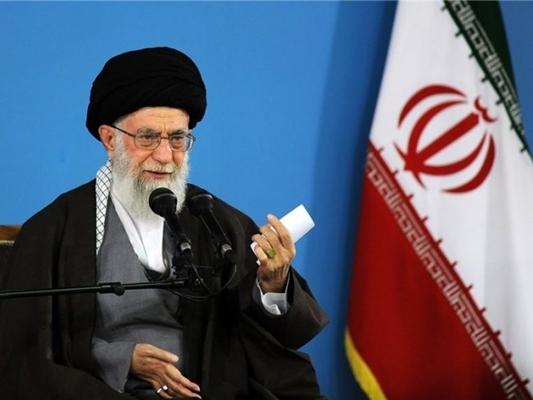 If you back down further, they will pick on the issue of [Iran’s] support for resistance,” Ayatollah Khamenei asserted. “If you keep backing down even further, they will bring up [the issue of] human rights. Then, if you accept their standards, they will go for eliminating the religious standards in [our] government,” the Leader added. The Leader was pointing to recent remarks by US Secretary of State John Kerry, who has said that the Islamic Republic’s continued support for the resistance movement in the region made it “very difficult” to help Tehran improve its banking system and business practices. The praise for Iran’s potentials is not “mere rhetoric,” Ayatollah Khamenei added, warning that hindering Iran’s scientific progress is among the major goals of enemies.